Aquaculture: Farmed fish could be better for the environment. That’s why consumers should soon prefer farmed seafood, not wild-caught. This salmon better not be from the ocean. 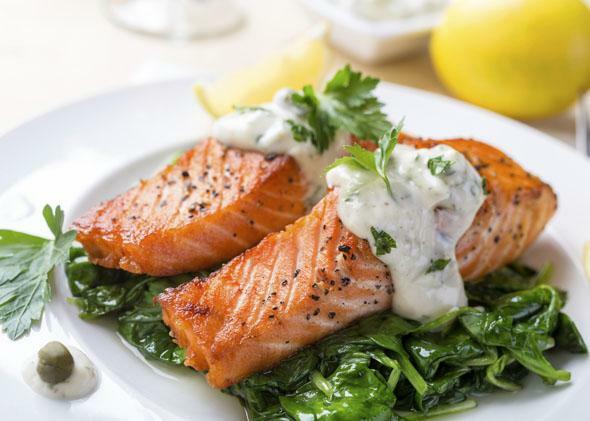 Early last year, a study by the international ocean conservation organization Oceana made waves by reporting that one-third of all seafood sold in the United States was mislabeled, according to DNA testing. Consumers were understandably upset to learn that their wild red snapper could be cheap, farmed tilapia or that their wild salmon was actually raised in a tank. Fish fraud, it seemed, was rampant. A joint OECD-FAO report shows that the global appetite for the fruits of the sea will grow over the next several decades. With wild fish supply flat, aquaculture is filling in the gap and taking pressure off our oceans. Since the 1990s, aquaculture production has more than tripled, and today, more than 200 species of fish and seafood are raised in farms. The rapid expansion of aquaculture has not been without tradeoffs, and, arguably, its meteoric rise contributed to our wariness of fish farms today. His declaration became a favorite mantra in the aquaculture world, capturing the pro-science zeitgeist that characterized America in the wake of the Russian launch of Sputnik. Rising consumer demand for seafood after World War II, coupled with increasing pressure on wild fish stocks, meant new solutions were needed. In 1963, President Lyndon Johnson appointed a scientific committee with the explicit mission of better understanding aquaculture. A main outcome was the Sea Grant Program (modeled after the land-grant program of the 1880s), which spearheaded ocean research at universities across the States. The buzz around aquaculture was not limited to the United States. Throughout the late 1960s and 1970s, aquaculture was touted by international development agencies as a way to provide food security to growing populations in developing countries. By the mid-1980s, the World Bank, the Asian Development Bank, and other international aid agencies were pouring about $200 million into aquaculture projects each year. By the 1990s, however, the dream of aquaculture began to resemble a nightmare of unsustainable growth. The rapid expansion of modern aquaculture—much like agriculture—had taken its toll on the landscape and people. Demand for cheap seafood led to habitat destruction, with places like Thailand tearing up delicate mangrove forests on the coastline to replace with intensive shrimp farms. Monoculture fish farms were at risk for disease. Waste and pollution from fish farms leaked out into the ocean, causing “dead zones” where no other plants or sea life could survive. Governments, researchers, and aquaculture farmers responded to this call. Reprocessing fish residues and byproducts into fishmeal, instead of using whole fish harvested from the ocean, is one option already in use. Plant-based feeds made from corn or soy can be coated in fish oil or fishmeal so that the carnivorous fish are “tricked” into a vegetarian diet. Recent trials have shown that soy and grain ingredients can serve as successful substitutes—one NOAA study successfully replaced up to 70 percent of conventional black sea bass feed with a supplemented soybean meal, with no observed changes in fish health or size. Even with the development of plant-based, rather than fish-based, feeds, there is no such thing as a free lunch. Using plants for aquaculture feeds still requires land to grow them. One study estimates that to produce enough feed for all Atlantic salmon from plant sources would require about 45 percent of the total agricultural area of Denmark. Genetic engineering also presents the possibility for more efficient and sustainable aquaculture. The genetically modified AquAdvantage salmon incorporates a growth hormone from a Chinook salmon into an Atlantic salmon, enabling it to grow to full size in half the time and using 25 percent less feed. Today, dozens of kinds of farmed fish enjoy that top rating. However, sustainable aquaculture is still largely limited to developed countries, while unsustainable practices still dominate in places with less regulatory oversight. Disease spread and habitat destruction remain central, and related, problems: Rapidly-spreading viruses have decimated monoculture Asian shrimp farms, and illegal dumping from shipping containers in U.S. waters could help spread disease. The losses caused by disease exacerbate habitat loss: One study found that Thai shrimp farmers would often just abandon a shrimp farm if it was decimated by disease, moving on to clear new mangrove forest and start over. Untreated wastewater also remains a key environmental problem for aquaculture, with excess nitrogen and phosphorus leaching into oceans and ponds and choking the existing ecosystems. But aquaculture farmers are starting to implement innovative solutions to the wastewater problem as well: Seaweed and some shellfish like mussels can thrive on the nutrients discharged by farmed fish. By creating a multiorganism environment that mimics the ocean, farmers can produce another marketable product and remove environmentally damaging excess nutrients. If done properly, aquaculture could become the best option for fish fans—but consumers will need to embrace it. Fish raised on new alternative feeds will have to taste the same for them to be widely accepted. Controversy over the genetically modified salmon means it has yet to reach market, despite FDA approval. Although farm-raised fish are already widely available in supermarkets, some consumers still prefer wild fish because they seem more natural. Additionally, there are some species of fish that are difficult to raise in captivity. Tuna, a favorite of sushi-lovers around the world, is perhaps the most famous example. A large, carnivorous species like the coveted bluefin tuna is difficult to breed in a controlled environment. However, extreme overfishing and continually rising demand have led researchers in Tokyo to develop the world’s first farmed bluefin, called the Kindai. You can taste it at French Laundry or the Ritz, if you can afford it. As chefs and consumers pay more attention to the consequences of overfishing, farmed fish are coming into the mainstream. The United States and other developed countries are leading the way to a future where all aquaculture can be conducted sustainably and can relieve pressure on ocean ecosystems and dangerously overfished species. In the not-too-distant future, when you see farmed salmon on the menu, you might worry that it’s actually wild.